Thank you very much for fixing the problem with Google Services. 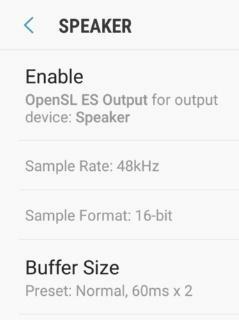 Hey guys, have anyone of you found any workaround for the annoying audio stutter/skipping faced on Xiaomi handsets? I basically tried everything, setting higher priority, moving all songs to my internal storage. 2) When another app is opened. It is irregular, but when it does happen, its frequent i.e. 6-7 times per 4-5 minutes. Still no scrolling texts despite everyone is complaining about it? Still impossible to use some shuffle option only within a specific sub-folder? Im not able to find the buffer size option. I think it was there in V2, I tried adjusting that as well, did not help. This issue is happening since the very beginning actually. Don't know whats wrong. I know Max has said he will look at scrolling text at some point in the future, but I seem to recall he also said it wasn't as simple a change as you would think because of the need to support page-change animations (and skins too). What Shuffle option are you still having problems with, I thought that had been addressed a few releases ago? Please address this sort of thing in separate threads though, re-posting existing of bugs and/or feature requests can quickly get lost if you post them in a New Release thread. Again, please post this in the relevant original thread so it doesn't get lost here. It's working for me on an ancient Galaxy S4 with Android 5 though (although it is rooted, so I may have just bypassed Google's daft SD Card access restrictions completely on that device). I know﻿﻿﻿﻿﻿﻿ Max has said he will look at scrolling text at some point in the future, but I seem to recall he also said it wasn't as simple a change as you would think because of the need to support ﻿﻿page-change animations (and skins too). What﻿ ﻿Shuffle option are you still having problems with, I thought ﻿that had been addressed a few releases ago? I'm still unable to shuffle folders inside another folder. In my own case, for example, I put every new album (every album has his own dedicated folder) that I've not listened to yet in a particular folder named "To listen". I would like to shuffle the folders that are in that particular folder only (without shuffling the songs inside folders, only the folders), but if I select the "Shuffle categories" option, it shuffles ALL my folders, including those who are not present in that "To listen" folder. I already did a thread regarding that behaviour a few months ago. Will post in it then. Oh thanks mate. I've set it to large and will check if I notice the same issue. Ah, that's a bit clearer. No, that is not supported. Shuffling the entire contents of a folder and its subfolders can be done now, but not shuffle the order of the just current layer of sub-folders while playing their individual contents in order. Generally, hit Restore Defaults on Audio Outputs, as there are too many options and most options combinations won't work properly.